Harry Potter and the Philosopher's Stone is the first novel in the Harry Potter series. The book was first published on 26 June, 1997 by Bloomsbury in London, and has also been made into a film of the same name. 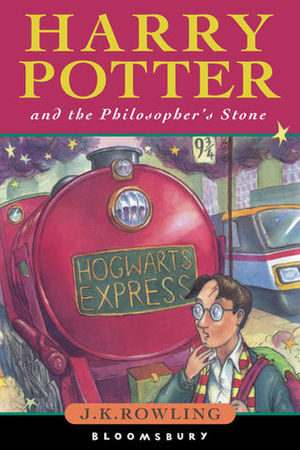 Both the book and motion picture were released in the United States under the name Harry Potter and the Sorcerer's Stone, because the publishers were concerned that most Americans were not familiar enough with the term "Philosopher's Stone" to gain the correct impression from the title (the renaming of books for international distribution is a common practise, even for highly known and internationally recognised authors. The decision was made to choose a title that was "more suggestive of magic", the naming of "Sorcerer's Stone" used with J. K. Rowling's endorsement after the contemplation of several possibilities). The change had no effect on the sales figures, and the Harry Potter series rapidly became one of the most-in-demand among young readers, who seemed to be undaunted by the ever-increasing length and complexity of the novels. –People meeting in secret all over the country offering a toast to Harry. Vernon and Petunia Dursley, who have a one year old son named Dudley, are proud to think they are the most normal people on Privet Drive. Vernon works at a drill company called Grunnings, while Petunia does housework. One day when Vernon is leaving for work, he sees a tabby cat reading a map and, later, reading the street sign. He then figures it is looking at the sign, not reading it. Later in the day, he sees people in cloaks talking in hushed voices. When he's sitting in his office, a swarm of owls fly past his window, but he takes no notice. On his break he goes to a bakery to get a bun and sees a group of extravagantly-cloaked figures. Even though they are speaking in hushed voices, he overhears some of their conversation, which includes a mention of "the Potters and their son Harry." Vernon finds this horrifying as the Potters were the family of Petunia's sister. Vernon and Petunia would be embarrassed if people found out they were related to the Potters, as the Potters were in some way strange. When he leaves his work, he bumps into a very small, similarly-cloaked man, who tells Vernon that someone called You-Know-Who has been defeated and that even Muggles like Vernon should be celebrating. Vernon does not know what a Muggle is and is offended that the man would call him one. That night, when Vernon arrives at home, he asks Petunia if her sister has been in touch. She becomes angry and says no. On the news that night, the newsman says owls had been seen everywhere earlier in the day (something unusual for owls), and that fireworks had been spotted in Kent. When the Dursleys went to bed, a long bearded man in a purple cloak appears out of nowhere outside of their home. This man is Albus Dumbledore, a wizard. He siphons all of the light from the street lamps with his Deluminator. He meets with a witch named Minerva McGonagall, who is revealed to be the cat Vernon Dursley saw earlier in the morning, and they speak about the deaths of Lily and James Potter and how their son Harry survived the attack. A motorbike with a gigantic man riding it lands in front of them. The giant, Rubeus Hagrid, is carrying baby Harry. He hands him to Dumbledore who leaves him and a letter to Vernon and Petunia on the doorstep of 4 Privet Drive and leaves. Everywhere in the world, wizards and witches are raising their glasses in a toast to Harry, who they proclaim to be "the boy who lived." –Description of the Dursleys' son. It has almost been ten years since the Dursleys awoke to find Harry Potter lying on their doorstep. Privet Drive and the Dursleys' house has not changed since that day. The only difference was the pictures of Dudley Dursley's aging. There is no sign that Harry lives there. However, in the cupboard under the stairs, Harry indeed sleeps. Petunia comes to his door and wakes him with a shrill voice. Harry is trying to think about the dream he had been having. It was about a flying motorbike, and Harry thinks he had had the same dream before. Aunt Petunia tells him to make bacon, as she wanted everything special for Dudley's 11th birthday. Harry dresses and goes into the kitchen where the table is covered in Dudley's presents. Harry thinks that because he lives in a cupboard, he is small and skinny. All he has to wear are Dudley's old clothes. Harry has jet-black hair and green eyes. His glasses are held together by sellotape because Dudley had smashed them so many times. The thing that distinguishes Harry the most is the lightning-bolt scar on his forehead. Harry often wondered how he got it, and the Dursleys have told him it was caused in the car crash that killed Harry's parents, Lily and James. He had to leave it at that, though, because the Dursleys' first rule was not to ask questions. Dudley comes in and begins to count his presents, only to find 37, which was one fewer than the year before. Aunt Petunia states they are going to buy him two new presents while they are out. Vernon tells Petunia that Arabella Figg, the next-door neighbour, has broken her leg and cannot take Harry when they go to the Zoo. They can't think of anyone else who can take care of him, so Harry has to go with them. Dudley is allowed to take a friend to the Zoo and chooses his friend Piers Polkiss. Piers comes to the house with his mother. A half-hour later, Harry sits in the car with Dudley, Piers, Vernon and Petunia. On the way, a motorbike overtakes them, and Vernon complains about them. Harry explains that he had a dream about a flying motorbike, and Vernon snappily reminds him that motorbikes do not fly. Harry thinks about all the strange things that had happened to him: He had once turned his teacher's wig blue, jumped onto the school chimney, and grew all of his hair back by the morning after a haircut. At the zoo, Dudley and Piers find all of the animals boring. Harry is left to watch a Boa constrictor as it sleeps. When Dudley tries to make it move, it wakes up but still doesn't move. The snake then begins to move after Dudley and Piers slink away. Harry is astounded by the snake; he speaks to the snake and finds that it understands him. Piers calls Dudley and Vernon back to the snake's exhibit. Dudley pushes Harry out of the way and presses his face against the glass. Harry becomes angry and somehow the glass vanishes and Dudley falls in. Harry believes he hears the snake speak as it slithers away. Uncle Vernon believes it was magic and blames Harry for it. Ever since the Boa Constrictor escaped from the zoo, Uncle Vernon blamed it on Harry, and he was locked in his cupboard for the longest time ever. When Harry was allowed out, it was the beginning of the summer holidays. Even though they were not at school, Harry still couldn't escape Dudley and his gang, who regularly visited the house. He usually wandered around Privet Drive to escape from them. He was glad however, that Dudley and Piers were going to Smeltings Academy while Harry was going to Stonewall High. Harry couldn't believe it. He had never had a letter to him in his life. On the back there was a wax seal with a Lion, Snake, Badger and Eagle surrounding a H. Harry returned to the kitchen and gave Uncle Vernon the two letters. He sat down and started to open the letter. Uncle Vernon told everyone Aunt Marge was ill after eating a funny whelk. Dudley saw that Harry had a letter and Uncle Vernon snatched it from him and showed Aunt Petunia. Uncle Vernon told Harry and Dudley to get out, so they shut the door as they stood in the hall. They fought over who would look through the keyhole. Dudley won, so Harry looked through the space between the floor and the door. Uncle Vernon and Aunt Petunia were discussing the seal on the back. Uncle Vernon said they should just ignore it. Later, when Harry was in his cupboard, Uncle Vernon came in and said he had burned the letter, and that they were moving him up to Dudley's second bedroom, which was used for Dudley's discarded toys. Harry moved all of his things up to the bedroom, wishing he had his letter. Downstairs, another letter came but it was addressed to Harry, the smallest bedroom, so whoever was sending the letters knew he had moved to the bedroom. The next morning, Harry crept down the stairs and approached the door. He was going to camp out there and when the post arrived, he would get and read his letter. When he went to the door, however, he stood on Uncle Vernon who had had the same idea. Every day, more letters appeared to Harry, and they were doubling in number. There were so many that Uncle Vernon nailed shut the letter box. But they were cropping up in the strangest of places, under the door, even squeezed through the window. Aunt Petunia found some in the eggs; then they got attacked by thirty or forty letters being fired out of the fireplace. Uncle Vernon became angry and said they were leaving. –Hagrid telling Harry that he is a wizard. There is another loud boom on the door and Dudley wakes up, thinking it is a cannon. Uncle Vernon comes through with a rifle, with Aunt Petunia cowering behind him. The door is blasted off its hinges and hits the floor. A giant enters and fixes the door into its frame. The giant asks for a cup of coffee then sits on the couch next to Dudley, scaring him away to hide behind Aunt Petunia. The giant turns his eyes to Harry, and greets him, saying he hasn't seen him since he was a baby. He says Harry looks like his father but has his mother's eyes. Uncle Vernon tells him to leave, but the giant merely grabs the gun, ties into a knot and throws it away. The giant presents Harry with a birthday cake. Harry asks the giant who he is and he says he is Rubeus Hagrid, the Keeper of Keys and Grounds at Hogwarts School of Witchcraft and Wizardry. Hagrid makes a fire and cooks some sausages. Hagrid is shocked that Harry knows nothing about Hogwarts. He gets angry at the Dursleys for not telling him anything about his parents' world, his world. Harry has no idea what was going on. Hagrid tells Harry his parents were famous and that he was a wizard, despite Uncle Vernon forbidding him to. Hagrid gives Harry the letter that he had been craving for. It told him that he had been accepted into Hogwarts School of Witchcraft and Wizardry, and that term began on 1st September. Hagrid took out parchment and a quill and wrote a letter to Hogwarts Headmaster Albus Dumbledore, explaining he had given Harry the letter. Uncle Vernon affirmed to Hagrid that Harry wouldn't be going, but the giant bet that a Muggle like him would not be able to try and stop him. Uncle Vernon revealed he knew that he was a Wizard, and Aunt Petunia told Harry that her sister, Harry's mother, was a witch. Petunia said they were killed by another wizard, and Harry screamed that Petunia said they got killed in a car crash. Hagrid was as outraged as Harry was that the Vernons had lied that much. He sat down and told Harry that a Dark Wizard named Lord Voldemort killed Harry's parents and tried to kill Harry too. But the spell he used backfired, and he was seemingly destroyed, only leaving Harry his scar. Hagrid told him that he brought Harry from the ruins of the house and brought him to the Vernons' house on 4 Privet Drive. Uncle Vernon said it was a load of rubbish, and tried to persuade Harry that whatever happened to his parents was deserved anyway, but Hagrid pulled an umbrella out of his coat and threatened Uncle Vernon. Harry doubted that he was a wizard but then believed that he was. Uncle Vernon makes the mistake of mocking Dumbledore and Hagrid swished the umbrella, in Dudley's direction, and Dudley sprouts a curly pig's tail. Hagrid asked Harry not to mention it at Hogwarts because Hagrid wasn't allowed to do magic, as he had been expelled. Hagrid takes off his coat and Harry sleeps under that for the night, for the day ahead. –Harry at the Diagon Alley. When Harry wakes the next morning, he tries to tell himself that what happened the previous night had all been a dream. He tried to convince himself that Hagrid taking him to a school for Wizards called Hogwarts School of Witchcraft and Wizardry had never happened. But when he opens his eyes, Hagrid had fallen asleep on the couch and he found that it had all happened. He hears a tapping noise coming from the window and lets in an Owl. The owl drops a newspaper on Hagrid's lap and begins to claw Hagrid's coat. Hagrid tells Harry to pay the owl so Harry does what he says and the owl leaves. Hagrid tells him they have to go and buy his things, but Harry worries because he hasn't got any money. Hagrid tells him his parents didn't leave him without money, and that their first stop was Gringotts, the wizard's bank. He explains that it is run by Goblins and that "you'd be mad to try and rob it". Hagrid says Dumbledore also needs something from Gringotts, so Hagrid has to go get it. They step outside the hut and step into their boat. Hagrid uses a bit of magic to speed things up for them. Hagrid says there are Enchantments guarding the vaults in Gringotts. Gringotts is all under London, and you would die of starvation trying to get out. Hagrid began to read the Daily Prophet and mutters that the Ministry of Magic were messing things up as usual. Harry wonders what the Ministry of Magic does, and Hagrid explains that they handle everything to do with magic. He says they wanted Dumbledore for Minister, but Cornelius Fudge got the job. As they passed through London, people stared at Hagrid a lot, due to his size and that he was pointing out things that Muggles were brilliant for inventing. Harry asked if there were Dragons guarding Gringotts. Hagrid says yes and mutters that he would like a dragon. Harry took out his list and read it out. It said he needed a set of robes, a pointed hat, Dragon hide gloves, and a winter coat. There was a list of his books and stationary equipment. Hagrid leads them both into a pub called the Leaky Cauldron that Harry did not notice was there. It was dark and shabby and everyone greeted Hagrid as he entered. When people saw Harry, many got up and shook his hand, including Doris Crockford and Dedalus Diggle. A man with a turban approaches them and Hagrid introduces Harry to Quirinus Quirrell, the Defence Against the Dark Arts professor at Hogwarts. They talk for a bit then Hagrid steers them out a back door into a small enclosed area with a few barrels. Hagrid takes out his umbrella and taps bricks with it, counting an order. Once he is done, a hole appears in the brick wall, slowly getting bigger, until the wall disappears fully, revealing a crowded street with people wearing robes everywhere with shops left and right. Hagrid tells Harry the street is called Diagon Alley. When they were walking down the street, Harry was trying to look everywhere around him, taking in as much as possible. At the end of Diagon Alley, there is a snowy white building, huge in size: Gringotts. As they enter, a warning echoes through telling them rob at your own risk. Harry and Hagrid go up to a Goblin and explain they need to take some money out of Harry's vault. The Goblin asks for Harry's key and Hagrid presents it, after sorting through many other keys. The Goblin calls upon another Goblin named Griphook to take them down to the vault. Hagrid also states they need to be taken down to remove the You-Know-What in Vault 713. Griphook takes them to Vault 713, and Hagrid removes the grubby little package there but can't tell Harry what it is. Griphook then takes them to Harry's vault, where there is a large amount of money piled up there that Harry owned. There were Knuts, Sickles, and Gold Galleons. Harry and Hagrid took a bit of the money for Harry's list, then left Gringotts. Hagrid had to stand for a bit as the cart that took them to the vaults made him sick. Hagrid decided they get Harry's uniform first so they entered Madam Malkin's Robes for all Occasions. Madam Malkin measured him then he sat on a chair next to a pale-faced boy getting his robes. The boy started to talk about smuggling a Broomstick into Hogwarts somehow, then about something called Quidditch. Harry felt very out of place with him, as he was talking about houses called Slytherin and Hufflepuff. The boy pointed out Hagrid then said the other kind shouldn't be allowed in. When Harry left, he told Hagrid and Hagrid said there were four houses at Hogwarts, Quidditch is a game played on Broomsticks and then left to buy Harry the rest of his things. All Harry had left was his wand, so he and Hagrid entered Ollivanders, a Wand shop. Mr. Ollivander came round, scaring them both, and greeting Harry and Hagrid. Ollivander began to talk about Harry's parents' wands, and how he remembers selling them. Ollivander touches Harry's scar and apologises for the fact that he sold the wand that caused it. Ollivander gave Harry a wand and told him to give it a wave. Harry did so, but it wasn't suitable for him, so Ollivander took it back. Harry tried many wands, but none of them seemed to work well enough for him. Eventually, he picked up a wand and he felt warmth in his fingers. Ollivander stated that it was curious that Harry should be destined for that wand when its brother gave Harry his scar. Hagrid took Harry to get something to eat in the Muggle world but Harry was worried that he wasn't going to fit in at Hogwarts as everyone expected great things from him. For Harry's birthday, Hagrid had bought for Harry an owl named Hedwig. Hagrid provided Harry with a train ticket, giving him the date, time, and location to catch the Hogwarts Express and told Harry that if he ever needed anything, he was to write a letter, and Hedwig would know where to find him. Harry then caught a train back to the Dursleys. –Vernon Dursley mocking Harry about the journey to Hogwarts. Harry’s last month with the Dursleys is unpleasant. The day before he is due to leave, Harry asks Uncle Vernon to take him to the King's Cross station. Uncle Vernon agrees to take him but ridicules him for saying he is to leave from platform nine and three quarters, as is marked on the ticket Hagrid gave him. The following day, Harry arrives at the station and stands between platforms nine and ten, wondering how to find platform nine and three quarters. Finally, he overhears some people mention Hogwarts School of Witchcraft and Wizardry; it is a family of red-haired children who seem to be bound for the school. He asks the mother for help, and she tells him to run through the barrier between platforms nine and ten. Harry does so, and he is astonished to find the train to Hogwarts on the other side of the station. Harry, then, boards the Hogwarts Express. On the train, Harry is introduced to Fred and George Weasley, twins who are returning to school, and to their younger brother Ron, another student who will be starting at Hogwarts. Ron introduces Harry to such details of wizard life as Quidditch, Famous Witches and Wizards cards, and Bertie Bott's Every Flavour Beans. One of the cards bears the picture of Albus Dumbledore. Ron, who comes from a poor family, cannot afford the pastries sold on the train, so Harry buys a lot with his newfound wealth and shares them with Ron. Harry also meets a somewhat annoying, overachieving girl named Hermione Granger and sees again the unpleasant boy from the uniform shop, whose name is Draco Malfoy, this time with his buddies, Crabbe and Goyle. After Draco made some rude comments about Ron, Harry rejects Draco's offer to advise him about associating with the right kind of wizards. All the students have heard of Harry, and Harry is not sure how to respond to his fame. Arriving at the station, the newcomers are led by Hagrid onto boats which they sail to the castle of Hogwarts. –Harry, about the Sorting Hat. The new students are greeted at the castle door by Professor McGonagall, who tells them they will soon be sorted into their houses. All Hogwarts students live in one of four residences: Gryffindor, Hufflepuff, Ravenclaw, or Slytherin, with each house having its own team for Quidditch. The houses are in a yearlong competition with one another to acquire the most points, which are earned by success in Quidditch games and given by teachers for academic achievement, and lost for student infractions, in order to win the House Cup awarded at the end of the year. As the students enter Hogwarts, ghosts appear in the hallway. The students are led to the Great Hall, where the entire school waits for them. They see an old pointy hat on a stool. When the students try on the Sorting Hat, it announces the house in which they are placed. Harry becomes very nervous. He has learned that he does not care for Slytherin house, as the students in it are unpleasant and Voldemort once belonged to Slytherin. The annoying girl Hermione from the train is Sorted into Gryffindor, much to Ron's displeasure. Finally, it is Harry’s turn to wear the hat. After a brief mental discussion with the hat in which it tries to suggest Slytherin to him, the hat places Harry in Gryffindor. Harry is pleased to find that Ron joins in Gryffindor with him. Draco Malfoy is placed in Slytherin. Everyone sits down to a grand feast to begin the year. Harry is overwhelmed by the variety of luscious food served. Sir Nicholas de Mimsy-Porpington, the resident ghost of Gryffindor (popularly known as Nearly Headless Nick because of a botched decapitation), introduces himself to the first-year students and tells them he hopes they will win the house championship this year. Over dessert, the discussion turns to the students' upbringings. A student named Neville Longbottom tells how his family thought he was a Muggle (or later referred to as a Squib), until he survived a fall from a window. Another student, Seamus Finnigan, talks about how his father, a Muggle, was shocked when first finding out his wife (Seamus' mother) was a witch. Harry glances around the room and notices a few of the teachers talking to one another. One of them, while speaking to Quirrell, stares malevolently at Harry, who immediately feels a sharp pain in his forehead scar. Harry finds out that this man is Professor Severus Snape, who teaches Potions. After dessert, Dumbledore gets up to make his welcome speech. He adds a few warnings about staying away from the Forbidden Forest and avoiding the 3rd-floor corridor on the right side of the school before sending everyone off to bed in their Common rooms. Harry finds life at Hogwarts unfamiliar and strange. Everyone talks about him, and an adult always seems to be around when he is doing something wrong. Harry finds all the classes interesting, with the exception of History of Magic. In the first Transfiguration class, only Hermione is able to make any progress at turning a match into a needle. Harry is relieved to see that his peers are just as lost as he is. During breakfast the first Friday, Harry's snowy owl, Hedwig, arrives with a tea invitation from Hagrid. Later, in his Potions class, Harry discovers that Professor Snape hates him, mocking Harry as "our new celebrity" and then humiliating Harry for his ignorance of potion-making materials. Harry brings Ron with him to Hagrid’s shack for tea. Harry and Ron are disconcerted by Hagrid’s huge and fierce-looking dog, Fang, but discover that he is gentle. Hagrid tells Harry that he is overreacting to Snape’s treatment, asserting that Snape would have no reason to hate him. Harry happens to notice an article from the wizard newspaper, the Daily Prophet, detailing a break-in that occurred at Gringotts bank in a vault that had been emptied earlier in the day. He realises that it happened on his birthday, the day he and Hagrid went to Gringotts. Furthermore, he remembers that Hagrid emptied vault seven hundred and thirteen, taking a small package with him as he left. Harry leaves Hagrid’s, his mind filled with questions. –Hermione complaining about their "adventure". Harry has been going to Hogwarts for around 2 weeks when he finds out that the Gryffindors will have flying lessons with the Slytherins, much to his disliking. Harry does not want to spend more time with Malfoy than he has to. However, Harry finds that he is quite a natural at flying. Madam Hooch leads the class, gently sending the new fliers off the ground. Neville has an accident when his broom runs amok and breaks his wrist. Madam Hooch takes him to the hospital, telling everyone to stay on the ground while she is away. Malfoy notices a Remembrall belonging to Neville, picks it up, and begins to fly around with it. Harry goes after Malfoy, who throws the ball in the air. Harry catches it spectacularly and lands safely back on ground. Just then, Professor McGonagall arrives, reprimanding Harry and ordering him to follow her. But instead of punishing him, McGonagall introduces him to Oliver Wood, captain of the Gryffindor Quidditch team, explaining that Harry will make an excellent Quidditch player. At dinner, Harry excitedly tells Ron about joining the Quidditch team but tells him that Wood wants it to be a secret. Malfoy comes over with his cronies Vincent Crabbe and Gregory Goyle and teases Harry about getting in trouble earlier. The tension grows and Malfoy challenges Harry to a wizard’s duel. Harry accepts, in spite of Hermione’s attempt to dissuade them from breaking the school rules. As Harry and Ron sneak out later that night, Hermione tries to stop them but gets locked out of the dorm (the Fat Lady has gone for an evening stroll) and must tag along. Neville also joins them, as he has forgotten the password to the common room and ended up sleeping on the floor outside. They arrive at the Trophy Room, the site of the duel, but Malfoy is nowhere to be found. Suddenly, they hear Argus Filch and his cat, Mrs. Norris, enter the room. With it obvious that Malfoy tricked them, they begin to hide and then run away. Not sure where they are going, they accidentally end up in the forbidden area on the third floor, staring at a large and scary three-headed dog. The children manage to get back to their dorm safely, though they are terrified. Hermione reprimands Harry but stirs his curiosity by pointing out that the dog was standing on a trapdoor. –The beginning of a great friendship. The next morning, Harry and Ron are discussing what the dog could be guarding when the mail arrives. Harry receives a Nimbus 2000, along with a note from Professor McGonagall summoning him to Quidditch practice. Malfoy tells Harry that first-year students are not allowed broomsticks. Malfoy then tries to report Harry to Professor Flitwick who just expresses admiration for Harry’s talent having heard from McGonagall. Harry later meets Oliver Wood to learn the basics of Quidditch, including the various positions on a standard Quidditch team and the implements used in the game. Oliver explains Harry's role as a Seeker: his job is to avoid other players and catch the Golden Snitch. A Quidditch game cannot end until the Snitch is caught, making the Seeker the most important player on a team. On Hallowe'en, Flitwick begins teaching his students how to make things fly, using the Wingardium Leviosa spell. Only Hermione succeeds; Ron, offended by her air of superiority, utters a nasty comment that Hermione overhears. Harry notices her running off in tears. Harry and Ron arrive at the Hallowe'en feast to hear Professor Quirrell, the teacher of Defence Against the Dark Arts, give a terrifying announcement about a twelve-foot troll in the building. As the prefects lead the students back to their dorms, Harry realises that Hermione does not know about the troll. They head off to warn her and come upon the troll. Unwittingly, they lock it in the girls' bathroom only to realise that Hermione is trapped in there with the troll. Using teamwork, magic, and a lot of luck, the three of them manage to knock out the troll. Professor McGonagall finds them and begins to scold the boys. Hermione interjects that Harry and Ron were looking for her. She then lies, saying that she went to face the troll herself and that Ron and Harry had been trying to save her from it. At this point, Hermione befriends them. –Lee Jordan, commentating on the Quidditch match. As November begins, so does the Quidditch season, and Harry is about to play in his first match against Slytherin. To prepare, Harry borrows a book entitled Quidditch Through the Ages from Hermione. Professor Snape discovers Ron, Harry, and Hermione out with the book one evening and confiscates it from Harry on the feeble pretext that library books may not be taken outside of the school. Harry’s suspicions of Snape continue to grow. Harry starts to notice that Snape is limping. Going off to retrieve the book from Snape, Harry overhears Snape talking to Argus Filch about the fact that the three-headed dog has attacked him, leaving a cut on his leg, which makes Harry even more suspicious. The next morning, the Quidditch match begins. Harry spots the Golden Snitch early in the game, and is flying toward it when the Slytherin Captain pushes him out of the way and is penalised. Later in the game, Harry’s broom begins jerking uncontrollably. Hagrid comments that only Dark magic could make a broomstick so hard to manage. Hermione notices that Snape is staring at Harry and muttering to himself, signs of casting a curse. As the Weasley twins try to rescue Harry in the air, Hermione rushes over to Snape in such a hurry that she knocks Quirrell over, sneaks behind Snape, and sets his robe on fire. Suddenly, the spell on Harry’s broom is broken and Harry is once again in control. He starts speeding toward the ground and lands, catching the Snitch in his mouth and nearly swallowing it. Hagrid takes Harry back to his hut with Hermione and Ron, who tells Harry that Snape was putting a curse on his broomstick. Hagrid does not believe this, asking why Snape would try to kill Harry. Harry tells Hagrid about Snape getting injured by the dog in the third-floor corridor. Hagrid involuntarily reveals that the three-headed dog, Fluffy, is his, and that what the dog is guarding is a secret known only to Albus Dumbledore and a man named Nicolas Flamel. –Harry looking at the Mirror of Erised. Christmas is approaching. Malfoy teases Harry about having to stay at Hogwarts for the holiday, as he does not have parents. Harry, however, is looking forward to spending Christmas away from the Dursleys, especially because Ron is also staying at Hogwarts, as Mr. and Mrs. Weasley were going to visit Ron's older brother Charlie in Romania. The day before the holidays, Hermione tears Ron and Harry away from a conversation with Hagrid to look in the library for more information about Nicolas Flamel. The librarian, Madam Pince, catches Harry prowling around the restricted-books section of the library and kicks him out. On Christmas Day, Harry and Ron awaken to presents, though Harry's are fewer. Harry receives a flute from Hagrid, a 50 pence coin from the Dursleys, some fudge and Chocolate Frogs from Hermione, and a knitted jumper from Ron's mother. He also receives an Invisibility cloak accompanied only by an anonymous note telling him that the cloak once belonged to Harry's father and to "use it well." That night, after a satisfying Christmas dinner and after Ron has fallen asleep, Harry tries on his Invisibility Cloak. Unseen, he is able to go to the library’s restricted-books section. But one of the books starts screaming when he opens it, so he quickly leaves. He passes Filch and hides in an old classroom as Filch is getting Snape to help him search the corridors. Inside stands an old mirror in a gold frame with the inscription "Erised stra ehru oyt ube cafru oyt on wohsi" ("I show not your face, but your heart's desire"). Harry looks in the mirror and sees many people standing behind him, but when he turns around in the room, he sees no one. Suddenly, he recognises that two of the people in the mirror are his dead mother and father . He tries to speak to them, but they can only communicate by waving. Harry lingers there a while but eventually returns to his room. The next night, Harry brings Ron with him to the mirror room. Ron does not see Harry’s parents in the mirror, but instead sees himself holding the Quidditch Cup. Mrs. Norris, Filch's prowling cat, notices them. On the third night, Ron is afraid of being caught and does not want to go back, as he does not trust the mirror, so Harry returns alone. There he finds Albus Dumbledore. Dumbledore explains to Harry that the mirror, which is known as the Mirror of Erised, displays the deepest desires of whoever looks into it. Harry is relieved to find that Dumbledore is not angry. However, he warns Harry that men have wasted away and been driven mad before the mirror and informs Harry that the mirror will be moved to a new location and tells him not to go looking for it. When Harry asks what Dumbledore sees in the mirror, his answer is "himself holding a pair of socks." Harry finds it hard to forget the image of his parents. Quidditch practice continues on even harder and it is revealed that Snape will referee the next match. Malfoy performs a leg-locker curse on Neville, and to cheer him up, Harry tells Neville he is "Worth twelve of Malfoy." Harry suddenly remembers that he read the name Nicolas Flamel on a chocolate frog card, which reminds Hermione that she had seen the name in a book she picked up from the library, and the team discover that he was a famous alchemist who is the only known maker of the Philosopher's Stone, which powers include turning any metal to gold and producing the Elixir of Life. The Gryffindor versus Hufflepuff Quidditch match arrives and Snape, who referees the match, is predictably biased, while on the stands Ron and Neville get into a scuffle with Malfoy, Crabbe, and Goyle after Malfoy made some rude comments towards the players of their house's team as well as both of them. Harry catches the snitch and wins the match under five minutes, though Ron did not see this due to fighting Malfoy, and Neville is sent to the hospital wing due to the injuries he sustained from fighting both Crabbe and Goyle. Later, Harry notices and follows Snape into the Forbidden Forest by broomstick where he meets Quirrell and they speak of the Philosopher's Stone. Harry thinks that Snape is trying to figure out a way to steal the Stone. –Ron, warning Hagrid after finding out about Norbert. Harry, Ron and Hermione meet with Hagrid, who confirms the Stone is being kept at Hogwarts. Hermione charms him into talking about the enchantments used to guard it: Fluffy, the three headed dog, is Hagrid's, along with enchantments from Professors Sprout, Flitwick, McGonagall, Quirrell, and Snape . After this, Harry complains about the high temperature in Hagrid's hut, only to discover he has a Norwegian Ridgeback dragon egg, which he names Norbert once it has hatched. Malfoy, who has been spying then, discovers the dragon. To solve the problem, they convince Hagrid to send the dragon off to Ron's brother Charlie. Ron's hand is bitten by the dragon, and he is sent off to Madam Pomfrey. Harry and Hermione smuggle Norbert in a crate up to the tallest tower under Harry's Invisibility cloak and on the way they see Professor McGonagall hauling Malfoy away to detention for being out of bed at night and speaking "lies" about Harry and a dragon. They pass the crate off to Charlie's friends, and head back down the stairs, where they meet up with Filch, realising too late they had left the Invisibility Cloak behind. –Firenze saying goodbye to Harry. Filch takes Harry and Hermione to McGonagall's office, where they meet Neville. McGonagall, very disappointed, takes 50 points each from the three of them and gives them all detention, which they will serve with Malfoy. Their popularity with the other students suffers because of this. A week or so before exams, Harry hears Professor Quirrell, sounding as if he is being threatened. So, Harry heads to the library to tell Ron and Hermione. They are convinced Snape was threatening Quirrell, and means to steal the Stone soon, and Hermione suggests they go to Dumbledore. Harry refuses, saying there is no proof. Harry, Hermione, and Neville receive notes from Professor McGonagall telling them their detention will begin at eleven that night. Filch takes them out to the Forbidden Forest, where Hagrid awaits to take them in to do a bit of investigating. Hagrid shows them some silver unicorn blood, and says they need to find the unicorn that is hurt. They split up, with Hagrid taking Harry and Hermione, and Neville and Malfoy going with Fang. Hagrid encounters a few centaurs, named Ronan and Bane, but gets no useful information from them. Suddenly, Hagrid sees red sparks in the air, signalling the other party is in trouble. He runs for them and returns, scolding Malfoy for startling Neville into sending up the sparks. Hagrid switches Harry and Neville, sending Harry off with Malfoy instead. They eventually find the dead unicorn, and see something drinking its blood. Malfoy screams and runs with Fang, leaving Harry, who is saved from the figure by a centaur, named Firenze, who tells Harry that unicorn blood can keep you alive, even if you are an inch from death, but curses you with a half-life in the process. He also asks Harry if he would not know anyone who would want to drink the blood, or get the Stone, and Harry realises that the mysterious figure was Voldemort . Back in the common room, Harry and Hermione tell Ron what happened. Afterwards, going into his bed, Harry finds that his Invisibility Cloak has been returned to him. –Professor McGonagall's wrong statement about the stone's security. After finishing their exams, Harry realises the suspicious coincidence in Hagrid wanting a dragon more than anything else, only to meet a stranger who had one to give him. He, Ron, and Hermione run to ask him about the man who gave Norbert to him, and he says he never saw his face, and that the man was dressed in a cloak. Hagrid also mentions that they talked about Hogwarts and Fluffy the three-headed dog. He also mentions that the stranger gave him drinks while getting information out of him. Hagrid lets it slip how to get past Fluffy, which sends Harry, Ron and Hermione off. They head for Dumbledore's office, only to see McGonagall, who tells them he has left for London. McGonagall insists no one could steal the Stone, but they decide to head out that night to try to get it themselves. After Hermione curses Neville in a Full Body-Bind Curse for refusing to allow them to leave, they head up to the third floor room, and start their intense trip into the seven Philosopher's Stone Chambers. They find the door ajar, and a harp on the floor. Harry plays the flute Hagrid got him for Christmas, and Fluffy goes back to sleep. They head down through the trapdoor. They land in Professor Sprout's room, full of Devil's Snare, which almost smothers them before Hermione lights a fire and drives it off. The next room, Professor Flitwick's, holds a bunch of flying keys and some broomsticks. Harry finds a silver one with a broken wing that is different from the others and catches it, unlocking the next door with it. The next room is Professor McGonagall's, and has a large chessboard, for a game of Wizard's Chess that Ron helps them win, at the cost of having to sacrifice himself and getting knocked out. Harry and Hermione continue to the next room, Professor Quirrell's, where they find an unconscious troll laying on the floor. Lastly, they enter Professor Snape's room, and find seven potions in bottles along with a roll of paper giving clues on which one to drink to continue, noting that three bottles have poison, two have nettle wine, one will send the drinker back, and the other will let the drinker move forward into the next room. Hermione tells Harry that it is a test of logic and not magic wherein most wizards fail. She solves the puzzle, and at Harry's instruction, drinks the one that will allow her to head back through the purple flame, while Harry drinks the one to head into the black flame and into the final room, where he is surprised at who he sees. –Quirrell, talking to Harry about Snape. It is Professor Quirrell who Harry sees in the room, not Snape. Harry, astonished, hears Quirrell tell him that, next to Snape, no one would expect him to try to steal the Stone and that Snape was actually protecting Harry. Harry notices the Mirror of Erised, and Quirrell stops to examine it, saying it is the key to getting the Stone. To distract him from the Mirror, Harry questions Quirrell, who says he is serving Lord Voldemort, and although Snape hated Harry, he never wanted Harry dead. Quirrell asks for help from his master to get the Stone, and a snake-like voice tells him to use the boy. Harry is told to look into the Mirror. He sees his reflection pull the Stone out of his pocket and put it back in, and Harry feels it drop into his own pocket. He lies to Quirrell about what he sees, telling him instead that he sees himself shaking hands with Dumbledore, after winning the House Cup for Gryffindor. The snake-like voice tells Quirrell Harry is lying and Quirrell takes his turban off to show Harry what lies on the back of his head. As Quirrell turns around, Harry is shocked to see another face where the back of Quirrell's head should be. The face has red eyes and a snake-like slit where the nose should be. Harry realises this is the face of Voldemort and Voldemort demands Harry give him the Stone. Harry refuses and runs, but Quirrell seizes him. However, the contact with Harry's skin burns Quirrell and causes him to have boils all over the area in which Harry touched him. Harry grabs Quirrell's face, then his arm, and holds on, with the blinding pain in his head building, until he feels the arm wrenched away before he blacks out. He awakes in the hospital wing with Dumbledore there, telling him Quirrell did not succeed at getting the Stone, and indeed the Stone has been destroyed. In spite of this, there are other ways in which Voldemort can return. He cannot be killed, and he left Quirrell to die. Dumbledore explains the reason why Quirrell could not touch Harry was because Harry's mother had died to save him, protecting him with her love. Harry also Dumbledore about what Quirrell mentioned to him earlier regarding Snape hating Harry due to hatred for his his father. Dumbledore responds that Snape was only grudgingly protecting Harry this year to pay off a debt he owed due to James Potter saving his life during their Hogwarts years. Harry then receives a visit from Ron and Hermione, who reveal that Slytherin came in first for the House Cup and, with Harry unable to play in the championship Quidditch match, Ravenclaw easily won the match, before Madam Pomfrey forces them out. Hagrid shows up later and gives Harry a book of photos of his parents and family. The following day, at the end of term feast, Dumbledore gives Ron and Hermione fifty points each, Harry sixty, and Neville ten, which allows them to win the House Cup, instead of Slytherin. Harry, Ron and Hermione all say their goodbyes before heading home. The United States is one of the few countries that published the book under the title "Sorcerer's Stone" whereas most countries (including the U.K. obviously) use the original and proper title of the book, "Philosopher's Stone". Rowling has said that she came up with the idea for the book after the train she was on (returning to London) was delayed for four hours. In the earlier editions of the Bloomsbury edition, the back cover portrayed an unidentified pipe-smoking wizard. It is possible that this was meant to be Nicholas Flamel due to the bulge in his pocket, which could be the Philosopher's Stone. The art for the cover of the book depicts Harry at Platform 9¾ wearing a Gryffindor scarf. However, Harry had not been Sorted by the Sorting Hat yet, thus not knowing he would be in Gryffindor. ↑ Hall, Dinah. "Children's Books: Junior Fiction" The Sunday Telegraph, 27 July 1997: 14. This page was last edited on 21 July 2015, at 14:00. This text is available under the GNU FDL and may have been adapted from the Wikipedia article about Harry Potter and the Philosopher's Stone (history).